"This is a recipe I have adapted a bit from my grandmother's. It's easy and perfect for a Sunday afternoon with fresh Italian bread." In a large pot over medium heat, cook onion in olive oil until translucent. Stir in garlic and cook until tender. Reduce heat, and stir in tomato sauce, water, parsley, basil, oregano, salt, cannelini beans, navy beans and Parmesan. Simmer 1 hour. Bring a large pot of lightly salted water to a boil. Add pasta and cook for 8 to 10 minutes or until al dente; drain. Stir into soup. 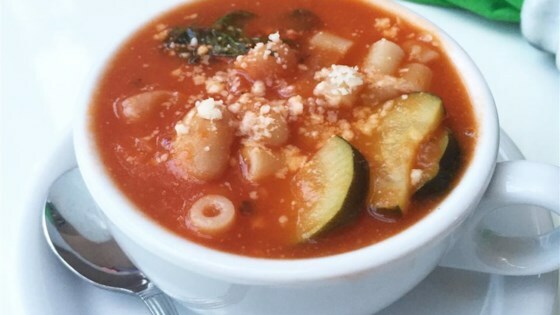 Italian flavor infuses a super hearty classic! This was delicious. Based on other reviews, I added 1/2 package frozen spinach, chicen broth rather than water, and 1 can tomato sauce & 1 can diced tomatos. Will certainly make again!